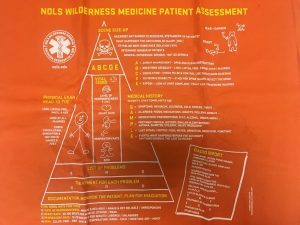 The most interesting brainwork was in realizing what makes wilderness first aid different. Compared to urban settings, there are many key points: professional help won’t be there in five, and accessibility and communicating with outside world (will you have phone coverage?) can be challenging. 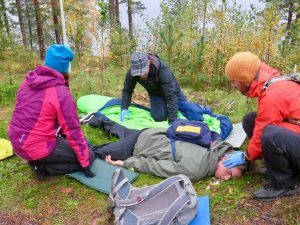 After our Ylläs-expedition, we had a 3-day Wilderness First Aid (WFA) course. The course has been developed by NOLS, a global wilderness school that offers different types of education programs mostly for people who want to work as a leader in outdoor activities. 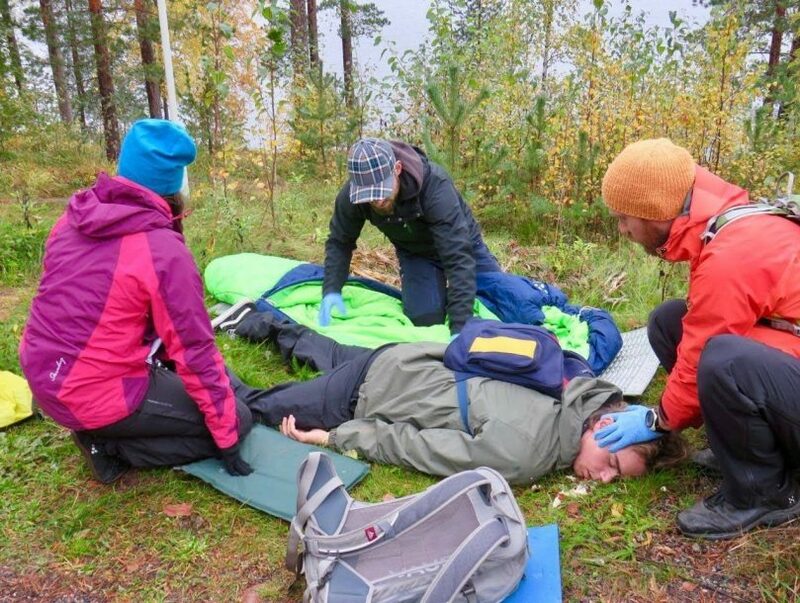 The WFA course is the first level of their First Aid education program, designed especially for people that are working or spending time in wilderness, where the help is not always instantly available if something happens. From the first minutes of the course we noticed that this is going to be a little bit different type of a first aid course that we were used to. The style of teaching was very enthusiastic and included a lot of acting and learning by doing. We started with the mental side of first aid: how it is always better to do something even if it feels scary, and how to deal with the situations afterwards. Then we continued with unresponsive patients, went through the recovery position, practiced it with each other, and did the CPR training with dolls and a defibrillator. In the afternoon, we had a lecture on the patient assessment system (PAS) triangle that NOLS has created to help trained first aider at an accident scene. We practiced the first steps of the system with made-up scenarios, where everyone had a chance to play the patient and the first aider. The second day of the WFA course was a highly informative day for the group. We covered serious topics, and we played these out in controlled scenarios. In the morning we continued with a lecture on PAS and Protocols. In the afternoon we delved in to Head and Spinal Injury, Medical shock, and Emergency and Evacuation Plans. We were taught the correct protocol for handling a patient who may suffer an injury to the spine or back area; always keeping the patients head and spine straight, especially when turning or lifting. And you should definitely turn the patient and place some insulation underneath if someone is laying on a cold ground! Unconscious patient, scenario. Photo by Lena Conlan. We ended the second day with seriously freaky scenario. Imagine: A person lies on the ground and doesn’t really respond to your approach, calls or touch but yes – the eyes are twitching with loud noises! Add some fake blood on forehead, oatmeal as a puke and disoriented mumbling. Afterwards you feel prepared for confusing encounters with persons who suffer from head injuries and need your help. At least you are motivated to stay awake during the following lecture. 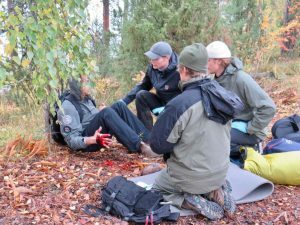 Despite the catchy scenarios, impressive acting, and problem-solving skills of our group, the most interesting brainwork was in realizing what makes wilderness first aid different from the others. Compared to urban settings, there are many key points: professional help won’t be there in five, and accessibility and communicating with outside world (will you have phone coverage?) can be challenging. It is important to try to avoid accidents by prior planning. So, get to know the risks of your activity, control them, and make plans in case something happens anyways! On the last day of our course, we focused on first aid situations which are more likely to happen to anyone outdoors, at least if you are a friend of grilling sausages by campfire. Burns, scalds, cuts and wounds – you know what I’m talking about. We learned how to take care of these, most importantly to prevent infection and promote healing. Since our heads started to feel heavy with information it was a great relief to have more familiar topics and hands-on practicing of wrapping sprained ankles, broken legs and hurt arms. Especially creating a support for broken leg from partially improvised material, like clothes and sleeping pads, was both fun and convenient. Hand impaled with a nail, scenario. Photo by Lena Conlan. We learned a lot during these three days: fantastic teachers with priceless information and techniques for saving and rescuing people from accidents and disaster situations. From a wee cut on the finger all the way up to CPR, bone brakes and spinal injuries, we covered a tremendous amount of information regarding the human anatomy and how to recognize medical issues. Additionally, we learned how to extract info from the patients to aid us rescuing and keeping them alive when the help is not always available. Exciting and informative days for us and the group.